Before I joined the YTH team, I remember anxiously awaiting to hear about upcoming speakers and breakout session topics for YTH Live, the youth + tech + health conference. YTH Live always hosts the most innovative leaders in the youth health field, and each year I walked away from the conference with exciting new ideas and solutions to empower youth to take charge of their health. I’m here now to give you a sneak peek at what YTH Live 2016 has in store for you. Get ready to learn, connect, and be inspired by innovative partners, advocates, and experts in the field of youth, health, and technology. Below is a confirmed lineup of speakers so far, and more are on the way! But that’s not all! A new film track will debut at this year’s YTH Live alongside a strong lineup of engaging plenaries, panels, and workshops. A few highlighted sessions are listed below, but make sure to take a peek at the full list of sessions. Attendees and presenters at YTH Live 2016 are developing groundbreaking technology to advance the health of young people—and you get to try it out! TECHCHECK is a hands-on session where YTH Live participants can explore new technologies—including apps and platforms for health, research, social skills, contraception, and more—and chat with the people who helped create them. These projects don’t leave anyone behind. By speaking up for youth and working alongside them, we can create effective health solutions that can inspire the next generation of advocates and justice. Let’s talk theory (Level-1), development (Level-2), and evaluation (Level-3) of using gamification for health. Come to this session to learn how game elements like points, leaderboards, and badges can encourage user engagement and behavior change, and learn how to evaluate it. Health projects are more engaging and effective when they’re visible. These programs and projects use film and video to amplify their impact on youth health. Just because it’s there, doesn’t mean it’s accessible. These panelists are taking a critical look at barriers to healthcare access and solutions that empower communities. Relax on comfy couches, charge your phone, and learn new and exciting skills in The Lounge. Don’t miss out the YTH Live photo booth, sponsored by Bedsider. 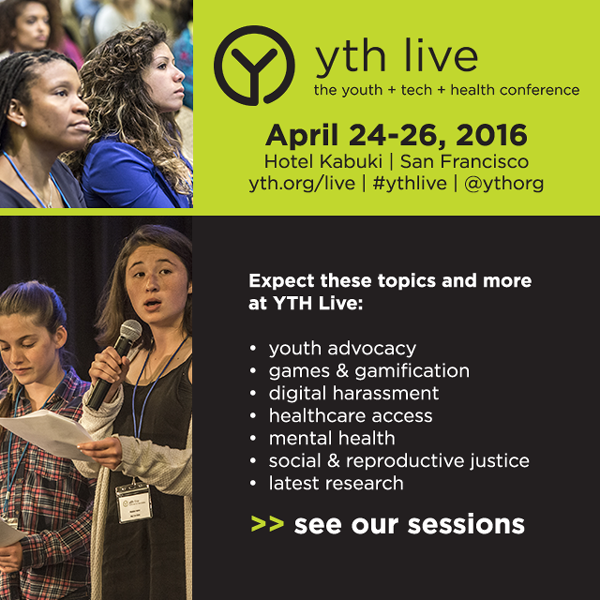 The three-day YTH Live conference takes place in the heart of San Francisco’s Japantown at Hotel Kabuki from April 24-26, 2016. It’s a one-of-a-kind opportunity for attendees to explore great food and diverse culture in the city by the bay. Make sure to register for YTH Live and reserve your room today to take advantage of the group rate. It’s a privilege to work alongside fellow YTH-ers, the Program Committee, and our Youth Advisory Board to develop the program for YTH Live 2016. Each and every year, the conference has gotten bigger and better, and our focus on youth has never been stronger. I hope to see you there!